Of course, coffee shops come in all shapes and sizes, and there’s more than one archetype, so this award reflects the wide range of coffee shops and all the different styles they represent, with entries from all over the world (well, the UK, USA and France!). There are seven Coffee Spots on the shortlist this year, all listed in order of publication. Joe’s Coffee, just off Bristol’s Whiteladies Road, is one of those places that just feels right for the outset. It’s not huge, but it’s how a coffee shop should be, warm, welcoming and, obviously, with great coffee (and cake). Sadly, as of a week ago, permanently closed. Fred & Ginger, also shortlisted for the Most Unlikely Place to Find a Coffee Spot Award, is a comfortingly familiar coffee shop in an unfamiliar setting. It’s the sort of place that wouldn’t look out of place in London, Bristol or Edinburgh. 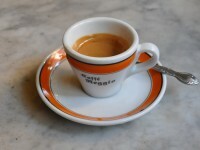 Good coffee can be a little hard to find in France, especially outside of Paris. 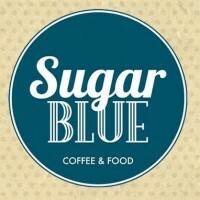 I was therefore pleased to find Sugar Blue: the instant I saw it as I walked down the street just north of Nantes’ splendid Place Royale, I knew that it was the place for me. With a couple of single origins on espresso, plus a another on filter, coupled with an extensive selection of food and cake, it’s a sure-fire winner. The Java Room is a lovely spot, the perfect, small town, neighbourhood coffee shop, friendly, relaxed and welcoming. In my head, all American coffee shops are just like this. Only it’s slightly warmer outside in my head (it was -15C the day I was there!). Norwich has a remarkably good speciality coffee scene, with Strangers Coffee House leading the way. With a house-blend and two guests on espresso, plus three pour-over options, it’s enough to challenge any coffee geek, but in the familiar, comforting settings of a lovely, traditional coffee shop so as not to scare the uninitiated! 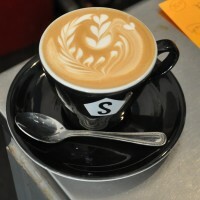 Also nominated for Best Espresso and the Coffee Spot Special Awards. I’ve been visiting Caffe Reggio, a Greenwich Village institution, for years, almost as long as I’ve been coming to New York City. If there’d been a Where It All Began Award this year, it would have been a sure-fire winner. As it is, it’s the quintessential American-Italy cafe, with a sumptuously-appointed interior. Printworks is the sort of neighbourhood café that you can find on any street in any town or city in the country. However, by serving Monmouth coffee and loose-leaf tea from Pekoe Tea and by doing it well, Printworks proves you don’t have to be a speciality coffee (tea) shop to serve decent coffee (tea). A special mention also needs to go to Bettys Café Tea Rooms, Harrogate (for looking just how a tea room should look), Philadelphia’s The Franklin Fountain (for looking just how an American ice cream parlour should look) and for York’s Harlequin Coffee and Tea House (which looks just how a tea room should look, even if it’s a speciality coffee shop is disguise! ).